This large two bedroom cottage is uniquely decorated using the beautiful colors of a Hudson's Bay Blanket - this cottage offers you a warm feeling from the moment you enter. A cast iron / propane fireplace in the corner makes for a perfect spot to curl up with a coffee on a chilly fall morning. Two spacious bedrooms complete with comfy pillows, beautiful quilts and down duvets (should you need them) adorn the charming bedroom furnishings. A beautiful deck overlooking Golden Lake allows plenty of room to barbeque, sit and visit and of course to set up that tripod to take some of the most amazing nature shots that you will ever see. The best part of this cottage is the unique collection of books and moose decor in honour of Algonquin Park and First Nations People. 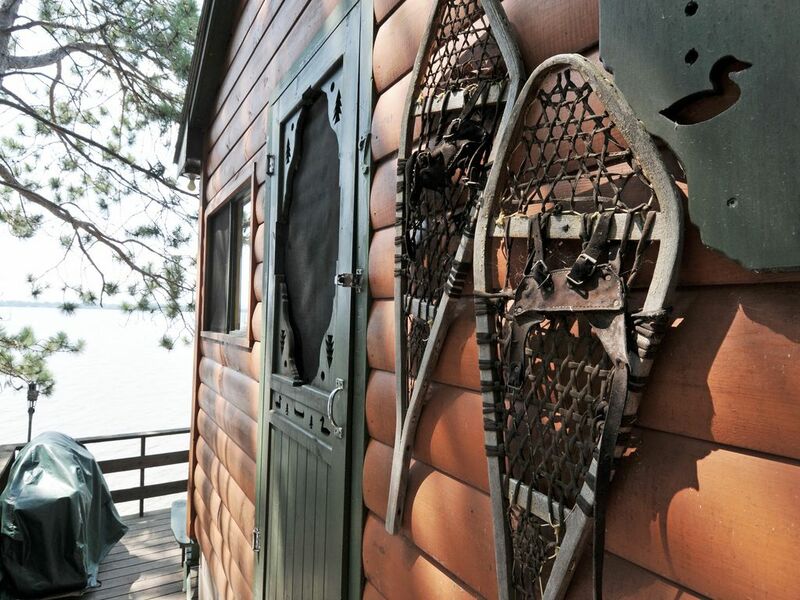 You will enjoy your experience catching up on local history and these close connections to both Algonquin Park and First Nations at Pikwakanagan on Golden Lake. This connected history enhances your vacation to the Ottawa Valley and leaves you wanting to return again and again. The most amazing hospitality ever! Very cozy and clean with a beautiful view of the lake. It was a perfect week at the cottage. It was very relaxing and a pleasant time unplugged from everything and spent quality time with the family playing board games at night, swimming, canoeing, driving to local towns. The cottage was cute, cozy, very clean and had everything we needed. Cindy and her staff were very hospitable and friendly. We will be back again. The cottage is exactly as shown in the photos. Very quaint and lovely. Extremely clean. Cindy just can't do enough for her guests. The view, wow, the view. The lake is crystal clear and warm. Very nice to have a dock for each cottage. We were able to put our kayaks on the dock when not in use while not inconveniencing others. The gas stove/fireplace was a nice touch for the one morning that was cool. We had sunshine and hot temperatures all week. A perfect vacation. I booked this property for my parents. The process was good and desmond was very professional. My parents would go again maybe i can come along this time. Our stay there was perfect! Ideal location, accommodation, access to amenities and staff. This cottage was just right for a small family. The decor could not have been sweeter and it was sparkling clean. The kitchen was equipped with everything we needed to make our own meals and the grill was great. Cindy and the rest of the staff were lovely and there to greet us and accommodate us at arrival and throughout our stay. We loved the canoes and kayaks and spent many hours just sitting on the deck drinking our coffee and wine. My six year old son had a fantastic time exploring the mini village and we even had a family trampoline jump. The added benefit of a park pass was the icing on the cake. I would HIGHLY recommend staying in the Algonquin Cottage for anyone wanting a stress free, relaxing, break with one or two children (does that exist? hahah). Thanks to Cindy and Judy for making our stay wonderful! Changeover for weekly rentals is Saturday. HomeAway.com functionality does not allow the Calander to show a check-out and in on the same day. Rates and minimum stay are not flexible. We receive a lot of emails and won't have time to respond to emails asking for discounts or 2-day rentals during the prime summer months.